AllTech is committed to providing the highest quality of services to environmental, regulatory, engineering, and related organizations throughout the Western Region. The Company is a privately held, relationship-based entity that has successfully engaged these markets since 1995. The Corporate Offices are located in Southern California with satellite operations throughout the Western States. AllTech’s reputation is based on its success in offering project-based support resources, regulatory training, and compliance program development. 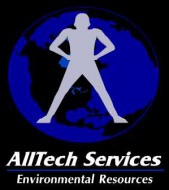 In 2003, AllTech created a complimentary work group focused on the fostering of advances in emerging tecnologies. These components allow clients to draw upon additional resources for flexibility in workforce control, cost containment, regulatory need, and impacts to our environment. AllTech’s management team is comprised of individuals with significant experience in both environmental management and regulatory disciplines. The organization’s staff and associate professionals are highly qualified to immediately support any project scope. AllTech imposes high standards on its Team Members, offering clients increased productivity and unmatched reliability.